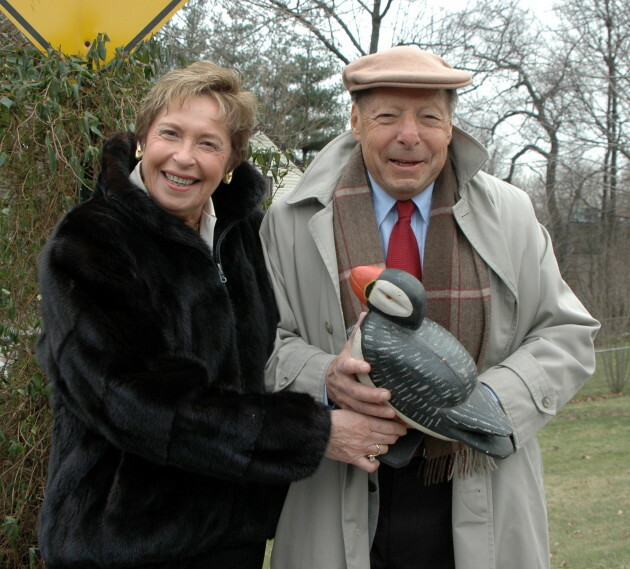 Puffin Foundation, Ltd. Executive Director Gladys Miller-Rosenstein and President Perry Rosenstein during renaming of E. Oakdene Ave. to Puffin Way by the Town Council of Teaneck. Once upon a time, the orange-beaked puffin—native to the waters of the Northern United States—was on the verge of extinction. But after concerted efforts by a slew of determined people, the puffin population is again flourishing. In practical terms, the 37-year-old philanthropy has supported a wide array of visual artists, writers, filmmakers, poets, musicians, journalists, and photographers. Among them are names that are likely familiar to Lilith readers, including Agnes Adler, Alice Matzkin, and Lilly Rivlin. Groups—and media—have also benefitted from the fund’s largesse: The Nation, In These Times, Jewish Currents, Mother Jones, Salon, and Jews for Racial and Economic Justice have received grants. The Puffin Foundation’s Executive Director, Gladys Miller-Rosenstein, met with Lilith reporter Eleanor J. Bader in mid-May in the group’s spacious award-and-art-filled office. Eleanor J. Bader: Were you one of the founders of the Puffin Foundation? Gladys Miller-Rosenstein: No. My husband, Perry Rosenstein, started the Foundation in the early 1980s and got 501(c)3 status so that it could operate as a not-for-profit entity. Then it basically just sat there. He was working—he ran the enormously successful Brighton-Best Socket Screw Company that produced the fasteners, bolts, and screws that every machine in the world needs—and none of his three kids were interested in running a foundation at that time. Over the years that changed, but let me backtrack a bit. Perry and I were both widowed in the early 1980s. I did not know Perry but he and my first husband grew up together in the Bronx Coops, a huge cooperative housing complex that had been built by the Amalgamated Clothing Workers of America in the late 1920s. They’d been friends growing up. They both volunteered to join the Navy during World War II and they both, thankfully, came back. For some reason, although they’d been in the same social group before the war, they lost track of one another afterwards. My husband and Perry’s wife died at about the same time and, approximately six years later, Perry and I met through a mutual friend. We married in 1990, and I moved to Perry’s home in Great Neck. By that point I was ready to retire—I’d taught elementary school in Ramapo, New York for 25 years and I decided to take a post-retirement year to regroup and figure out what I wanted to do next. After a while I decided to work in the offices of the Puffin Foundation and see what could develop. EJB: Why did you decide to make the arts your funding priority? GM-R: Both Perry and I love culture—dance, theater, opera—and believe that the arts can speak to people in a way that verbiage and other mediums do not and cannot. Our mission is to go where other funders don’t go, so this seemed like a natural fit. We have two grant cycles a year. The first goes from January 1 to July 1 and allocates grants—typically $1000 to $2500—to individual artists and arts organizations. The second cycle funds media, another of our passions, and we award grants to publications that we believe do good investigative reporting on issues like labor, the environment, LGBTQ concerns, feminism and women’s issues. Additionally, publications that promote secular Jewish culture—an understanding of, and appreciation for, Yiddishkeit—among younger people are of enormous interest to us. I want to stress that despite our devotion to funding artists and arts groups, we have continually expanded what we do. For the past several years, we’ve collaborated with the Nation Institute on an annual human rights award, a creative citizenry award, which is given to someone who has done distinctive and courageous social justice work. So far, we’ve give the prize to Dolores Huerta of the United Farm Workers, Robert Moses of The Algebra Project, the founders of the Innocence Project, and Cecile Richards of Planned Parenthood. This year we gave the award to two lifeguards who’ve brought immigrants and refugees to safety. These men have literally saved hundreds of people who are so desperate to flee war, poverty, and hunger that they travel on rafts and in rubber boats. We’re thrilled to be able to support these humanitarian efforts. EJB: In addition to providing funding, the Puffin Foundation has a wonderful gallery as well as a large meeting area. Can you say a little about how the space is used by the wider community? 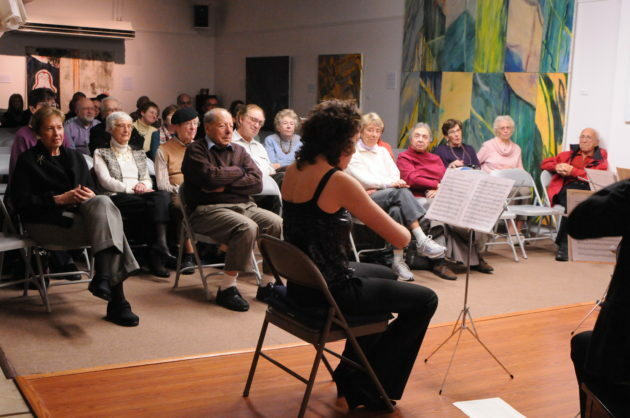 Classical Concert at the Puffin Cultural Forum. GM-R: We have programs here every weekend—all kinds of music, talks, documentary films, plays, and an open mic. We try to vary what we offer. We’ve brought people in to deliver lectures. Michelle Alexander, Robert Meeropol, Katha Pollitt, and Jeremy Scahill are just a few of the people who’ve spoken here. Attendance varies. The room can hold 110 people but we usually get between 60 and 70 for each program. We also run a weekend photography workshop, now in its 14th year, that enrolls students ranging in age from 14 to 82. Each spring we exhibit their work in the gallery. In addition, there’s a drama workshop that meets here once a week. EJB: Your office is located in a virtual forest. How did that come about? GM-R: Perry had his business here and sometime around 2003 he saw surveyors measuring the land surrounding the business. He became worried that the city would come in and cut down the trees. Perry can be a like a matador fighting a bull and once he got the idea to turn the wetlands into a public park, to be maintained through a public-private partnership, he promoted it everywhere he went. The Bergen County Parks Department eventually agreed to the plan. Under our auspices we had two miles of walking space constructed; it’s a raised walkway through the wetlands. A local muralist turned four giant concrete pipes that could not be moved into a graphic depiction of this area’s history, starting with the Lenape who were the first inhabitants. A sculpture garden enhances the parking area. We’ve been gratified to see that the park is well used every month of the year. EJB: Are there any projects that you’re especially proud of? GM-R: Perry’s particular pride and joy is the Puffin Social Activist Gallery located at the Museum of the City of New York. It opened in 2012 and has 14 sections, two of which change every two years. The Gallery looks at different types of activism and showcases the ways that activists helped New York City to develop. Thousands of children, elementary through high school, have visited the exhibition and have looked at the photos, memorabilia, and interactive displays. Our goal here is for people to leave with an understanding that every single person can go out and make change happen. EJB: How do you decide what projects are worthy of support? GM-R: This was a big question for us in the early 1990s and we went to see people at the Rockefeller Foundation and asked staff there that question. They advised us to remember that our primary purpose is philanthropy. Our mission statement sets high standards. Our giving is directed towards people who share our beliefs and vision and who do work that will create a fairer and more just future for everyone. Perry is now 91. Everything he has left when he dies will go to the Foundation. One of his sons, Neal, currently works at the fund and will eventually take over the day-to-day operation. Perry’s daughter runs the Puffin Foundation West Ltd., but it is a completely separate organization. EJB: Are there other Puffin Projects that are near and dear to you? GM-R: So many! We’ve been working in Haiti to bring sanitary supplies to three clinics that were built after the 2010 earthquake. We’re working in Ghana to teach girls aged 14 to 18 how to make sanitary napkins because if they don’t have supplies they often don’t go to school when they are menstruating. We support the Teaneck International Film Festival and help with distribution of the Teaneck Kids‘ Chronicle, a newsmagazine produced by middle and high school aged children. Oh, I almost forgot something incredibly important! We support Camp Shomria, a three week program located in Liberty, New York that brings Israeli and Palestinian youth together each summer. It’s a mini Seeds of Peace, a beacon of hope for a future in which we will co-exist together.